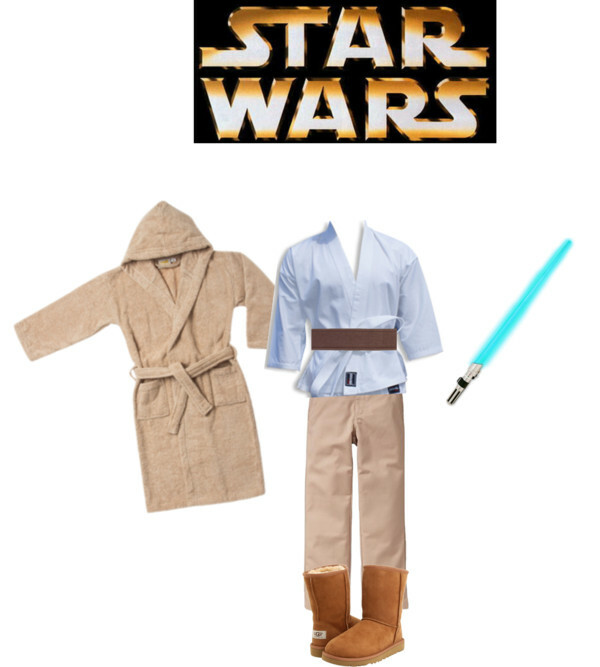 Shop your Kids’ Closets for Halloween Costumes! Shop your kids’ closets for these super cute Halloween Costumes! 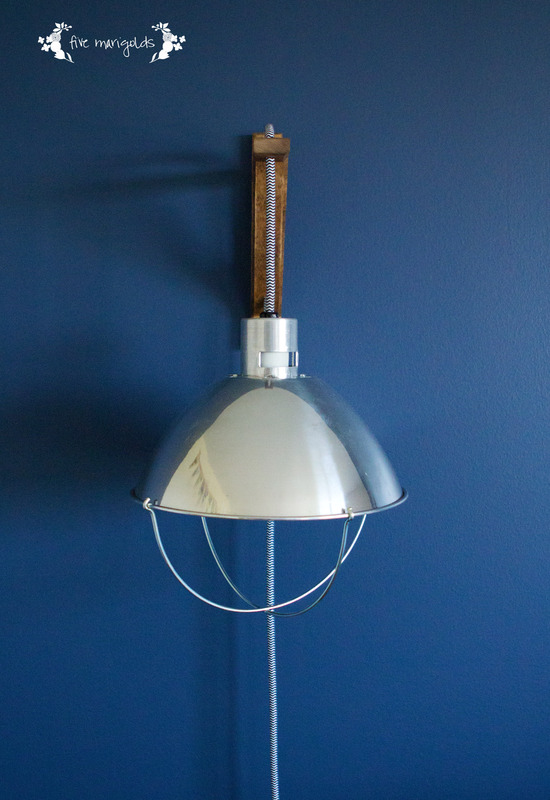 And here’s how it looked on Dub. 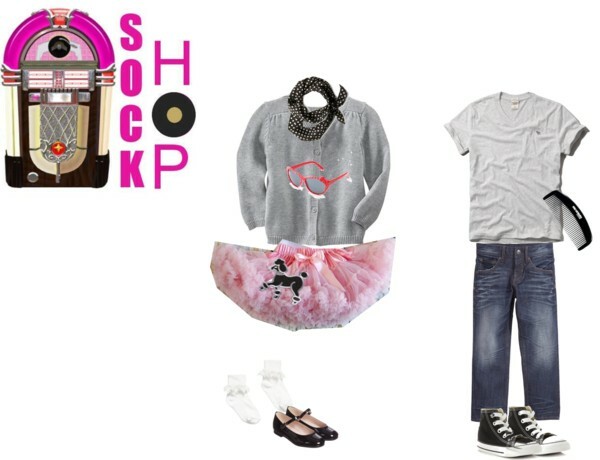 Sock Hop – I love this look for a brother and sister! 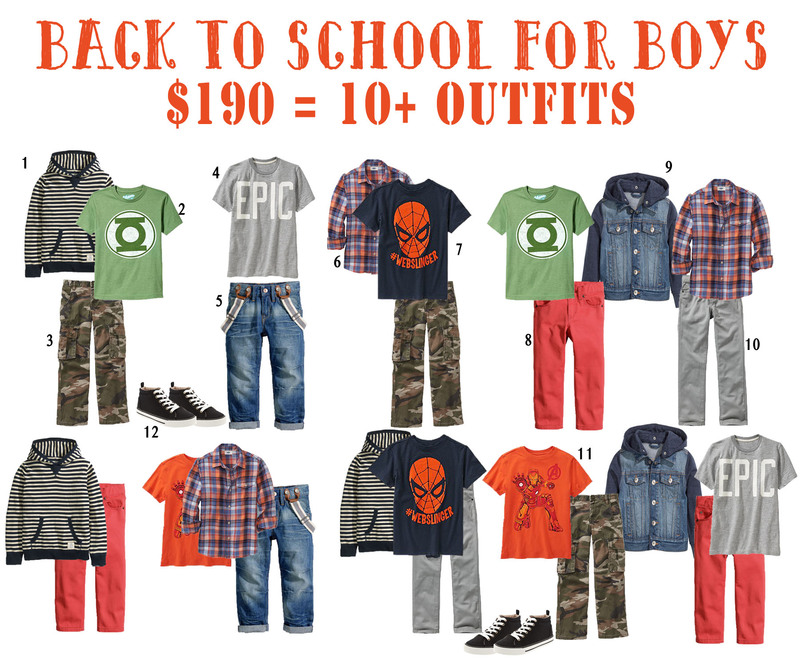 The boy look is super easy, of course. For the girls, I paired a pink tutu pettiskirt with a cardigan, scarf and some black Mary Janes. Either cut out your own “poodle’ or grab a really inexpensive one online. 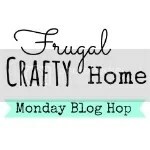 Add some cute glasses for a final touch! 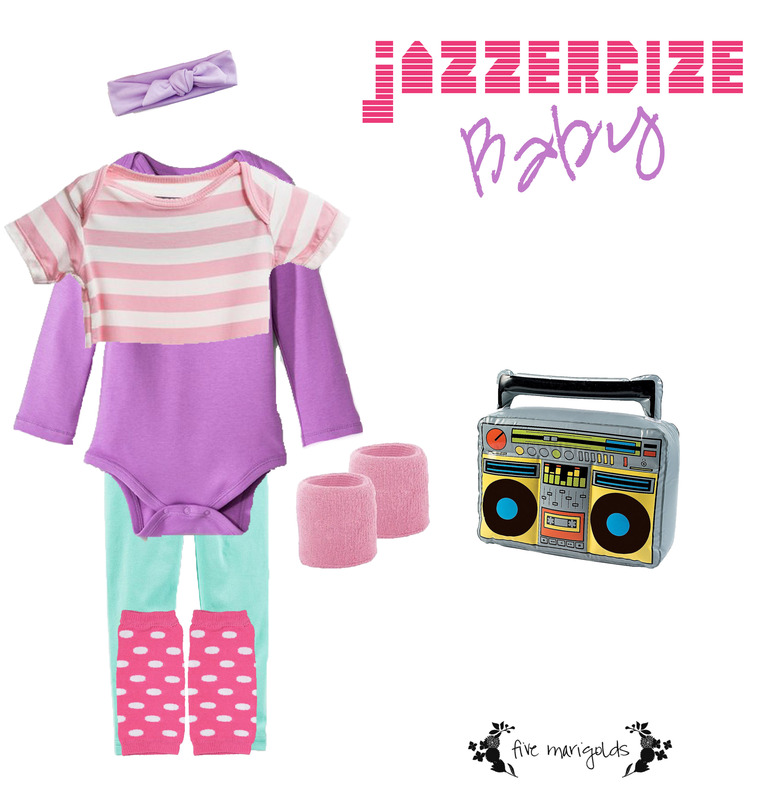 Baby Jazzerciser: This goes down as my favorite costume yet and it’s super easy. 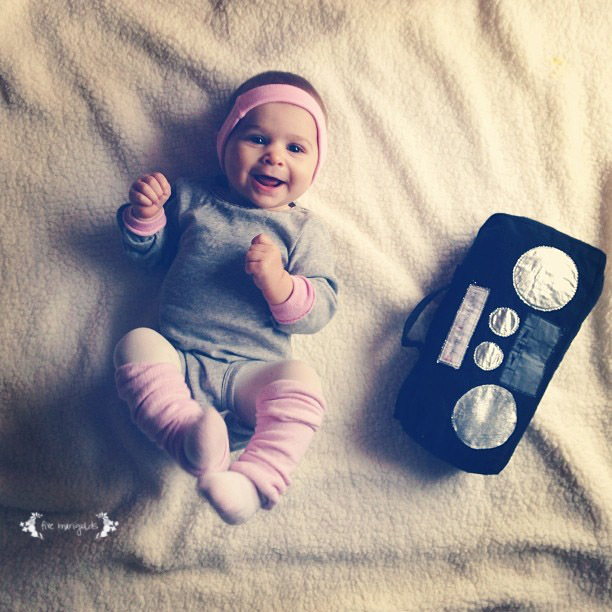 Just pair a baby onesie with a bright cut-up onesie, legings or tights, some baby legwarmers or Baby Legs (or cut up some old socks) and use a knit baby headband for, well, the headband. I actually cut the elastic tops off of some baby socks for the little baby wristbands! My mother sewed an adorable boom box to complete the look. 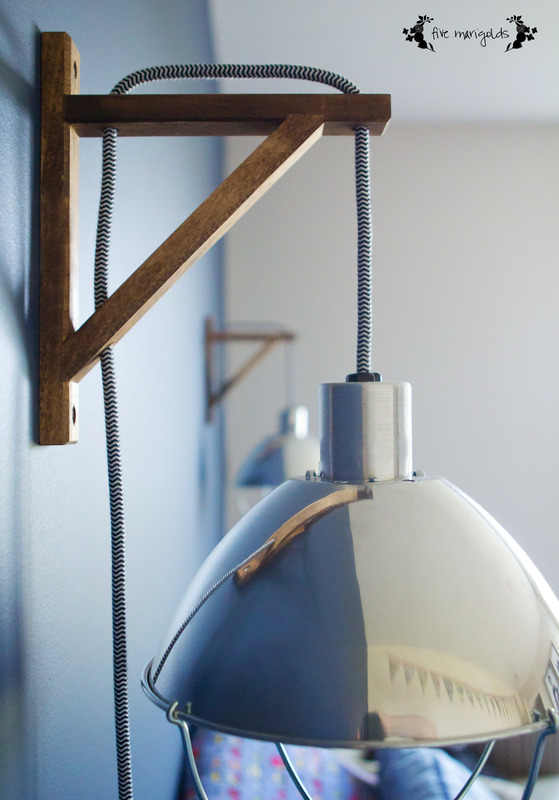 You can get something similar here or here. Baby Kitty Cat: This one can’t get any easier. 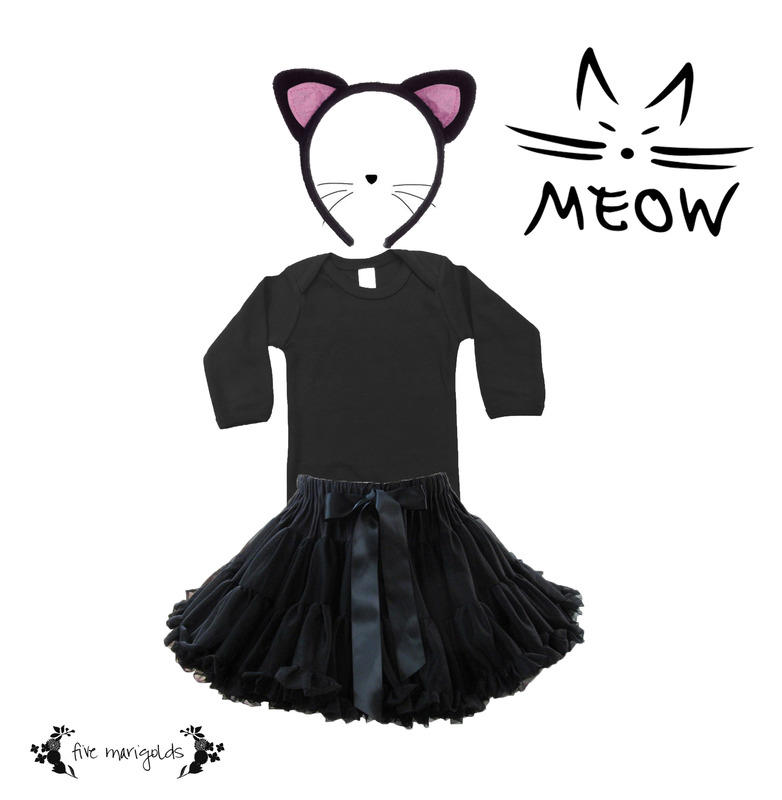 Combine a black baby onesie with black leggings or tights, and maybe a cute matching fur vest or black tutu pettiskirt, and you’ve got yourself a kitty cat! Add the finishing touches of a black nose and whiskers using eyeliner, and don’t forget the kitty ears! You can currently buy kitty ears headbands at the Target Dollar Spot, online here, or you can make them on your own. 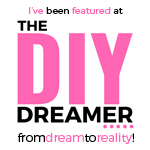 Use a thin feather boa from the dress up pile, and cut it up to make “fur” wrist cuffs and use as the tail. This entry was posted in Halloween and tagged 50's, Aerobics, Baby, boys, cat, costumes, diy, dress up, Exercise Baby, Girls, Halloween, Jazzercize, Jedi, Kids, kitty, Let's Get Physical, Look for Less, Luke Skywalker, on a budget, Shop your closet, Sock Hop, Star Wars, tutu on September 27, 2015 by fivemarigolds. When Dub predictably requested a Star Wars theme for his 6th birthday, I’ll admit I was a little excited. 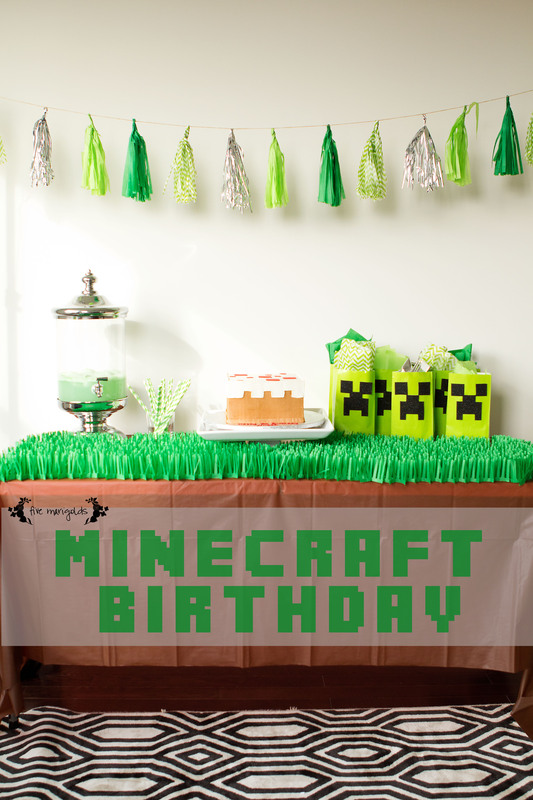 I’d already been brimming with fun ideas for his party, but when he insisted on his first “friends” party, I was stumped. Our home just isn’t big enough for entertaining larger crowds, and I didn’t really want to do a Chuck E Cheese type of party. So, we decided to hold it at his dad’s industrial garage. 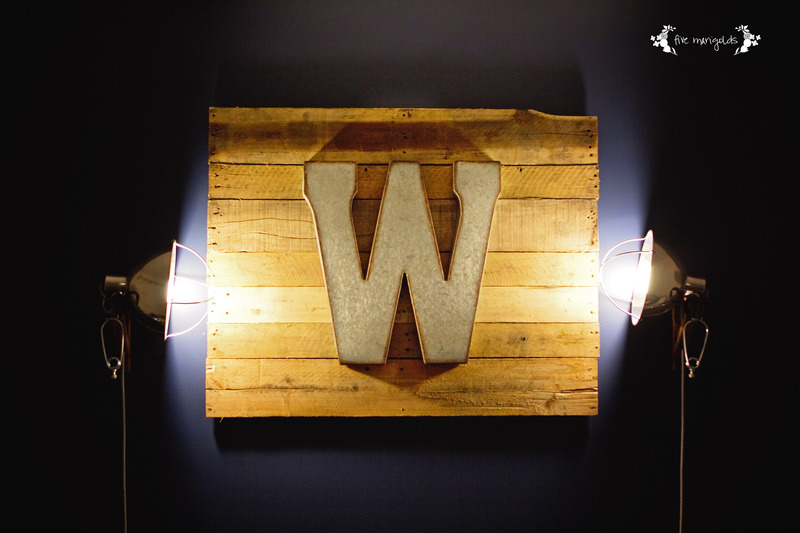 I’ll share the details of this party in a series of posts. This post will focus on the Boba Fett Buffet. First, I started with the settings. 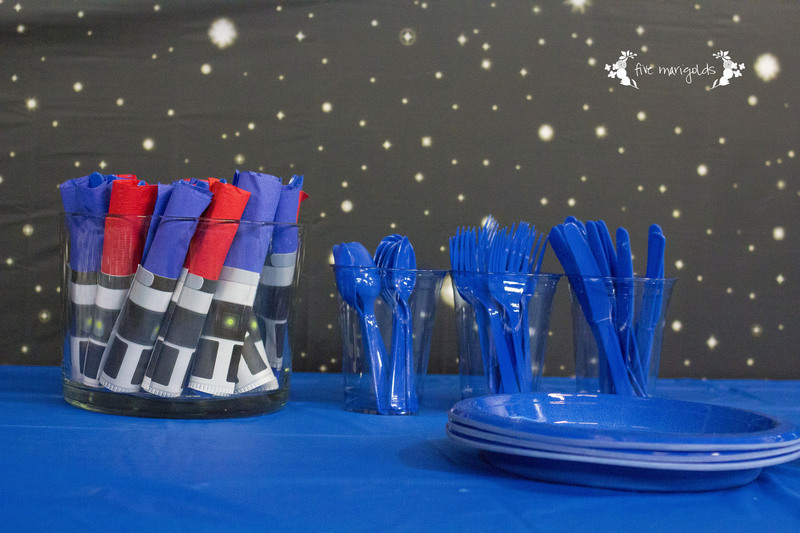 I bought inexpensive tablecloths from the Dollar Store and I bought a starry sky backdrop that I used behind the buffet and for a photo booth that I’ll share later. 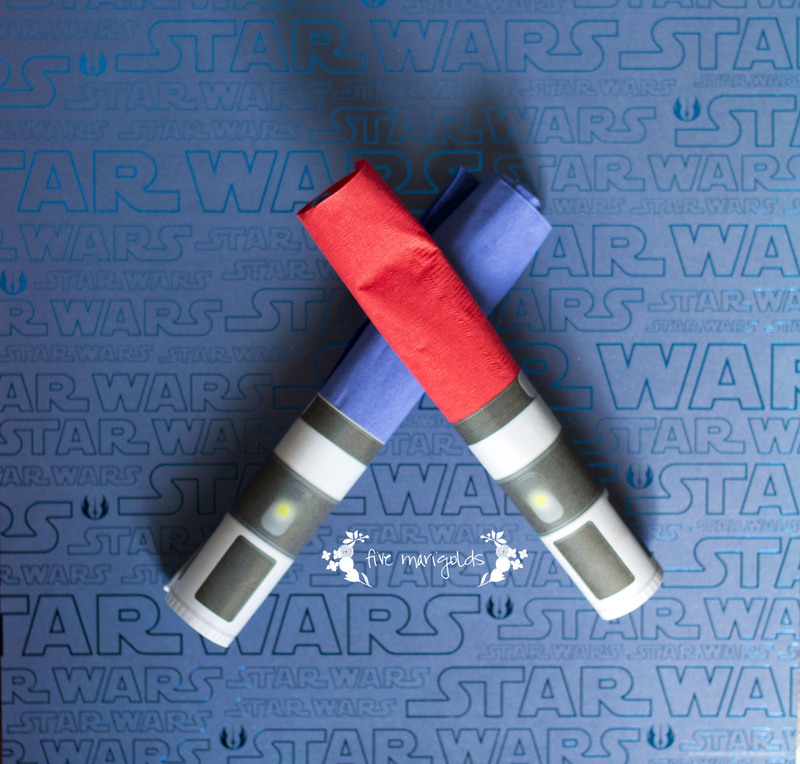 I downloaded a light saber paper craft from starwars.com (the handle for Yoda’s light saber) and used it to roll up the plastic tableware in red and blue napkins. I got the kids involved here, assembling the proper tableware and rolling it up, and I finished it off with the handle. Next, I designed some creative table tents in PhotoShop to label the food: Yoda Soda, Death Star Salad, Hunger Destroyer, Vader Veggies, DroidDrink, and more. For the Droid Drink, I bought the mini water bottles from Costco. I used this free download to wrap each bottle with an R2D2 label. 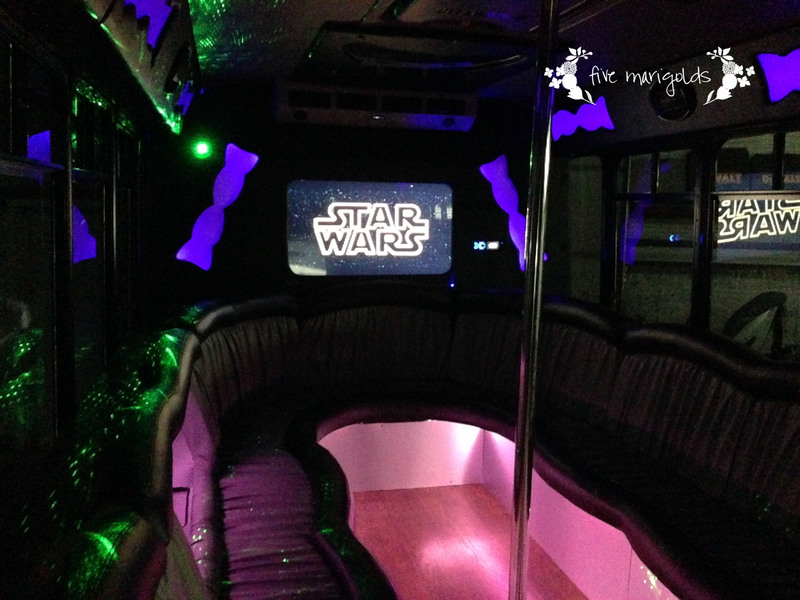 Since my husband’s business is a limousine company, we decided to leave in their limo party bus and play Star Wars on the sound system. 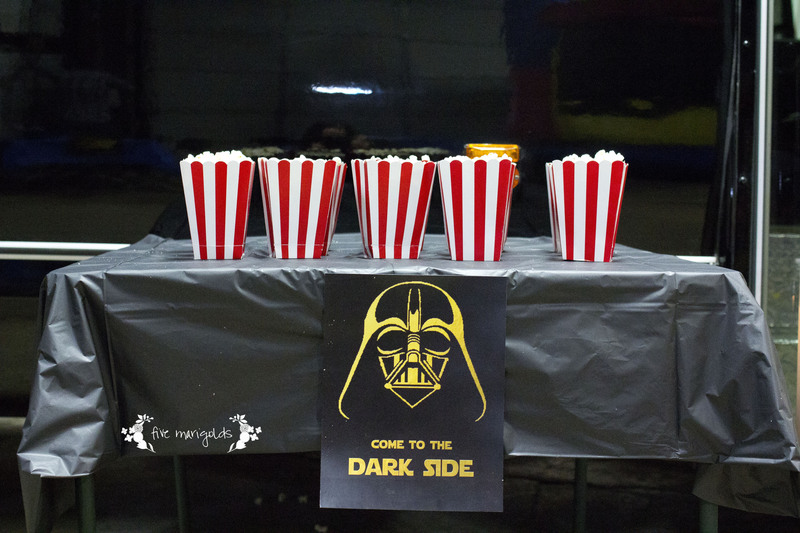 On the outside, we set up a little table with popcorn in festive containers to create a movie theater experience, which the kids loved. The bus has a music synchronized laser show that really added a little something to the Star Wars experience. 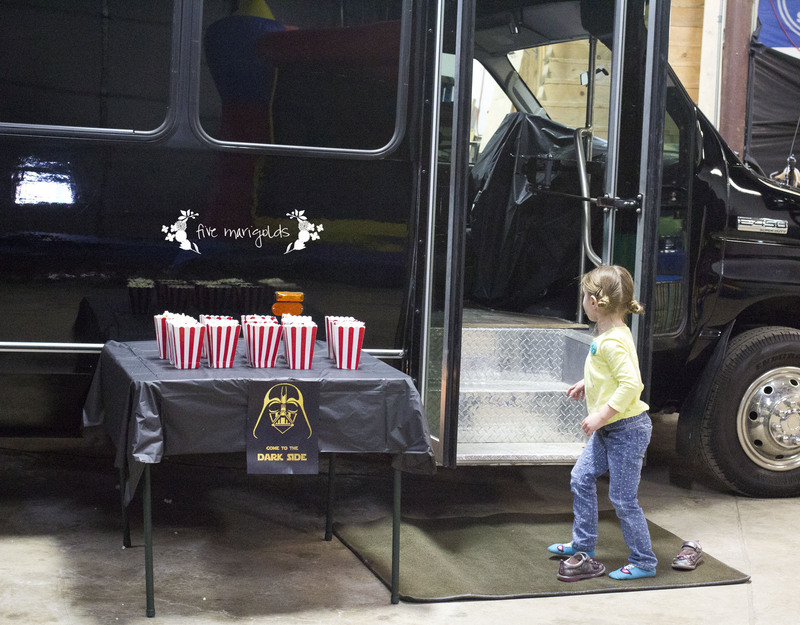 While I admit, leaving the bus in the garage was mostly practical and was helpful for setting the theme, I didn’t have high hopes that among all the activities that 15 6 year old boys would sit down and watch a movie. I was so wrong! 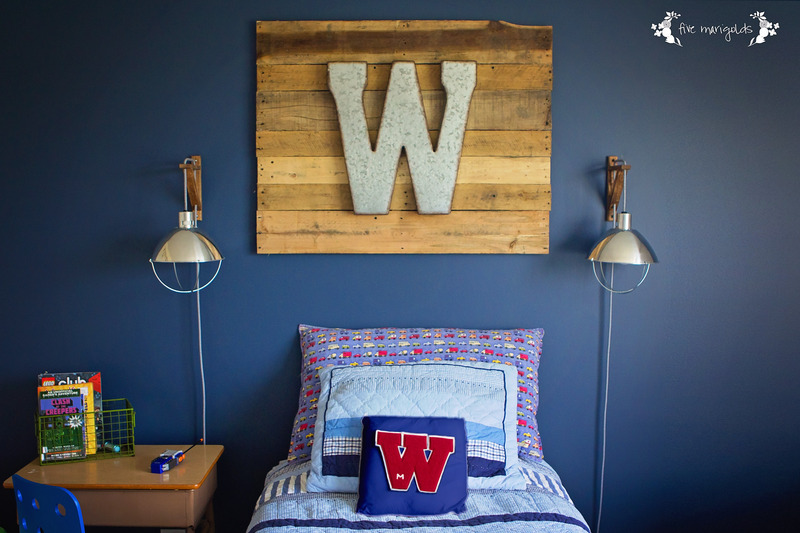 They loved this feature and spent a surprising amount of time watching the movie. Finally, the creme de la creme: the R2D2 cake. A very talented friend (who just opened her own restaurant!) made this for us, and it was as delicious as it was spectacular to look at. The kids waited for me to cut it up, as they all had very specific parts of R2D2 that they wanted to eat. That concludes the food portion of our Star Wars birthday party. 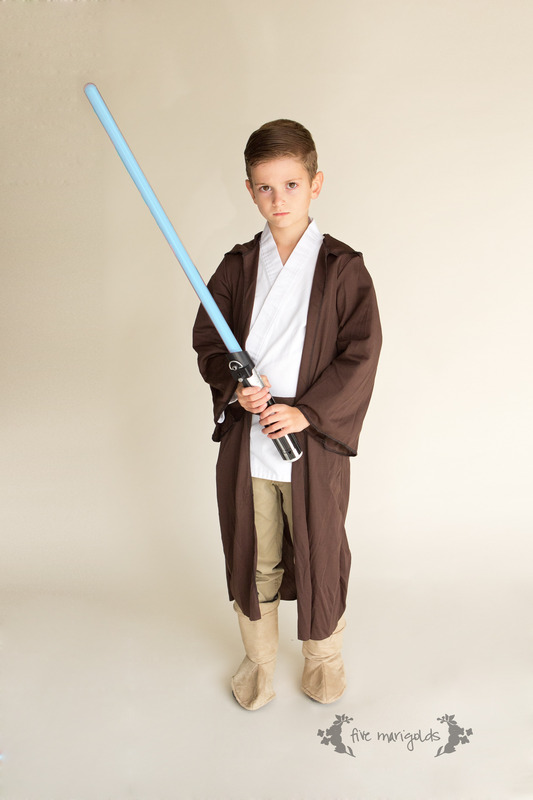 Stay tuned for more on our photo booth and Jedi Training activitites! 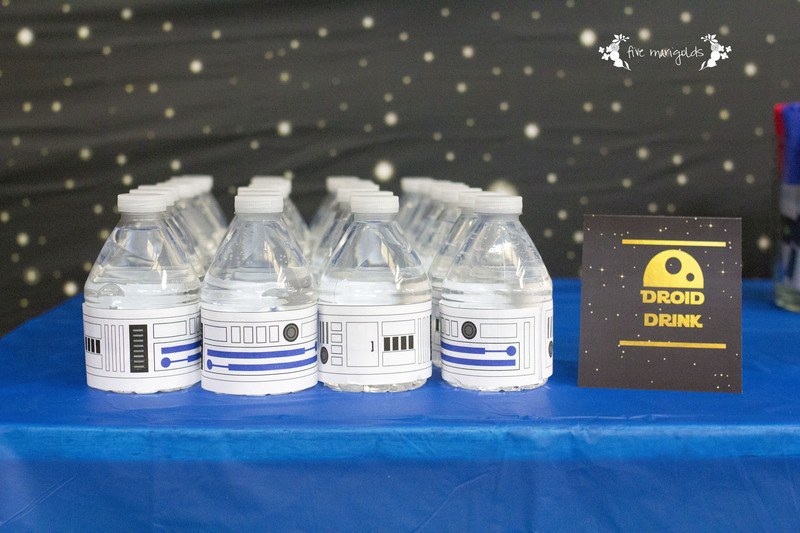 Looking for more Star Wars birthday party ideas? 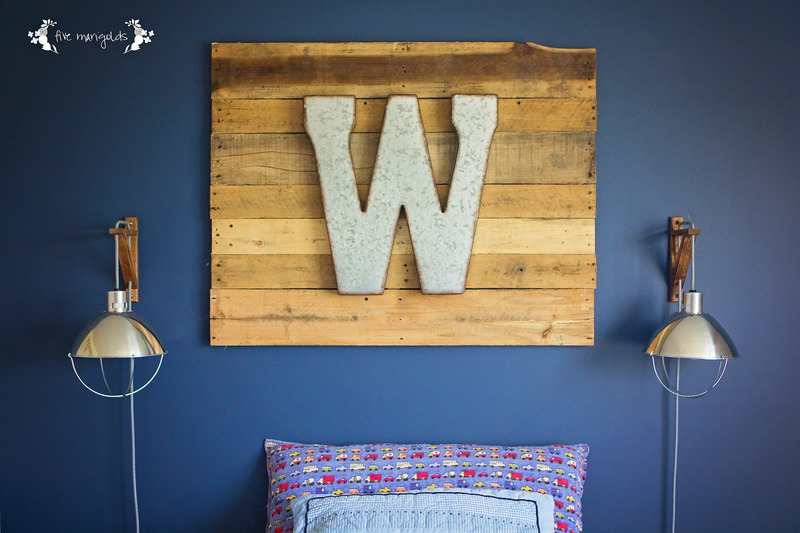 Find my Pinterest inspiration board here. 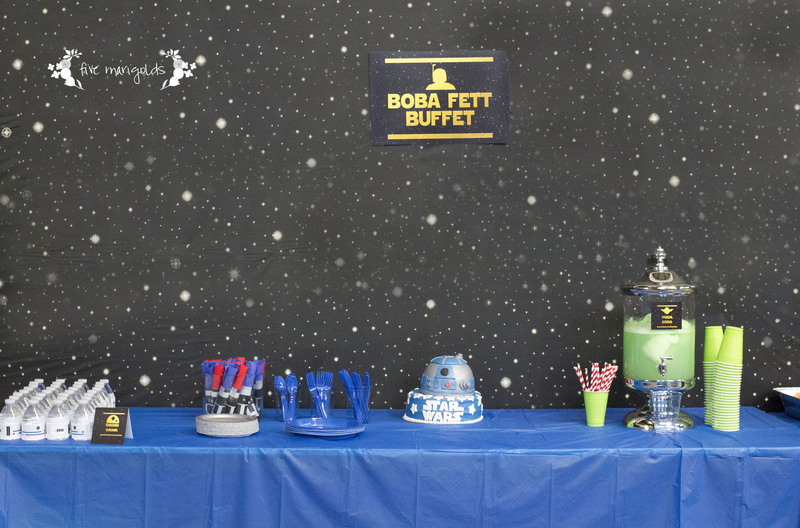 This entry was posted in Birthday and tagged birthday, Boba Fett Buffet, boys, Dark Side, Darth Vader, Droid Drink, Fondant Cake, Jedi, Light Saber, Movie Theater, party, Party Bus, R2D2, Star Wars, Yoda Soda on March 13, 2014 by fivemarigolds.